God needs the people themselves to save the world . . . The world of the poor teaches us that liberation will arrive only when the poor are not simply on the receiving end of hand-outs from governments or from the churches, but when they themselves are the masters and protagonists of their own struggle for liberation. 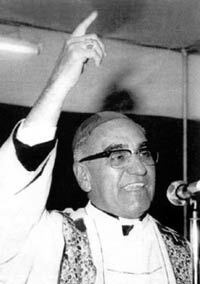 Today marks 31 years since Monsignor Oscar Romero, Archbishop of San Salvador and voice for the poor of El Salvador, was assassinated by a paramilitary death squad while celebrating Mass. It’s hard to overstate the impact that Oscar Romero — as an activist, a Christian, a writer, a martyr — has had on my spirituality, politics and worldview. On this point there is no possible neutrality. We either serve the life of Salvadorans or we are accomplices in their death….We either believe in a God of life or we serve the idols of death. I can’t add anything to that, so I’ll just ask that you let these words frame today for you, wherever you may be. I just found your blog, and love your insights and perspectives. I, for one, would be curious to hear more on your thoughts re: “solidarity” and some of those readings you mentioned. Here are some of the authors that I love about solidarity though: Jon Sobrino, Gustavo Guttierez, Elizabeth Johnson, Dorothy Stang, Dorothy Day (she never writes directly about solidarity, I don’t think, but she was a living example of what that meant), Henri Nouwen, and in a totally different way, Paul Farmer.